To find out what amount you might expect Wealth Builder Account to return at the end of your investment term, please click on the button below. After clicking you will be redirected to the website with the calculator shown on the right side. 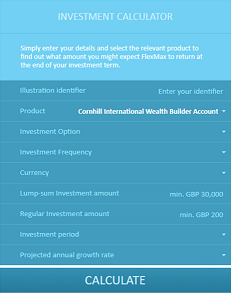 Please select product Cornhill International Wealth Builder Account from the product menu and simply enter Investment requirements.